This Drive-Thru was a Tour de France knit. All our evenings for the past three weeks were spent cheering on the boys in the peloton but especially Thor Hushovd from Norway. His remarkable sprints and gritty determination in the mountains won him the honor of the Maillot Vert. Congratulations Thor! 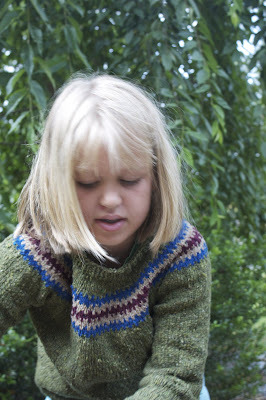 The second time around, this sweater was even faster and easier. The yarn is once again Jo Sharp Silkroad Aran Tweed, knit on US 6s and 7s. If I were to knit it again, I would CO more stitches for the cuffs of the sleeves - they seemed a bit snug on both of the girls. R doesn't seem to like a tight color, so this sweater is a bit looser at the top than I would like. But she loves it. She is actually wearing it inside in the AC today because she doesn't want to take it off. True sweater love! I have truly appreciated your kind words and prayers concerning my mother's cancer diagnosis. We continue to live day by day and to take the difficulties as they come. Thank you so much for your thoughts and good wishes. About two months ago, I found out my mother was sick with a mysterious GI illness. A month ago yesterday, we learned that the mystery illness was in fact Stage IV metastatic pancreatic cancer. Six to eight months. Best case scenario. Everyday has been different and challenging for my mother, yet she is emerging from this first shocking month courageous and spunky. We're slowly finding a rhythm as my brothers and father and I put together the puzzle pieces of caregiving. I initially thought that caregiving would mean lots of knitting by my mother's bedside - not so bad, right? But it turns out, it's much more frenetic: running errands, organizing medications, scheduling doctor's appointments, gardening, cleaning, and cooking. Except for the hours spent in hospital waiting rooms, there hasn't been much knitting time. Luckily, I had the best project in the world for this situation*. 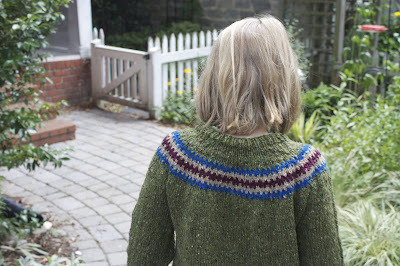 The Drive-Thru sweater by Wendy Bernard. 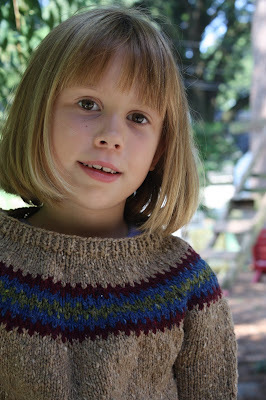 This child's yoke sweater is knit in the round with worsted-weight yarn. It is seamless and quick. So quick that I knit it in less than a month - and remember, I am a slow, slow knitter. A knitter who cannot at this moment dedicate any part of her brain to charting, modifying patterns, or stitch counting. The shaping is pure Elizabeth Zimmerman so you know that it is tear-free and fun. I used Jo Sharp Silk Road Aran Tweed. Sigh. A heavenly yarn. I chose an expensive yarn that would provide some tactile delight and luxury - my mother would sometimes just stroke it while I knit. I started a second Drive-Thru for my other daughter, mixing the colors around. Because I'll need it for the next few weeks. And then after that, maybe one for myself ... one day at a time, one stitch at a time. *Socks would work as well but my daughter really needed a sweater. Having resolved to Knit Less in 2009 (and blog a lot less -- hello, two months since my last post), most of my knitting projects are short on ambition, but long on satisfaction. Since my last big project, I made a lot of simple, little projects, all of them gifts, almost all of them from stash. 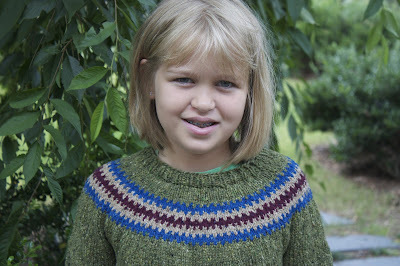 Here's the first: one simple yet stinkin' cute sweater for the daughter of my dear friends Andrea and Tanya whom we visited in May in Providence. This sweater took less than a week to make. A yoked sweater knit in the round in a rich red color, it's all about the simple. But those owls have such an impact! They are adorable without being ducky-bunny twee. It makes a unique statement in a world of boring baby sweaters. The biggest challenge by far was the buttons. Joann's did not have 30 matching buttons, and being a lazy, impatient sort, I did not want to wait for a new shipment, look online, or go to yet another store. The simplest solution, one inspired by Kristy, was to go with different colored eyes, so I simply gave one owl dark blue eyes, while the rest are light blue. It is a quirky, individual design element, which is the Whole Point of Handmade Items, no? I used one of my very favorite baby yarns, Mission Falls 1824 Wool (machine wash & dry! awesome rich colors! 50% off at my LYS! ), and used only 3 skeins despite its total crap yardage. Baby Sami, 6 months old, is growing like gangbusters, so I made her about a one year size so she can be warm and owly this winter in New England. 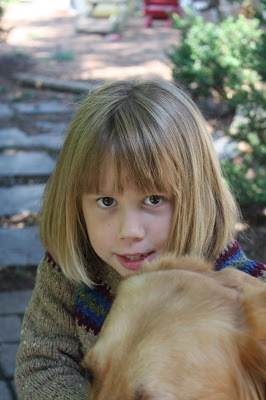 The next sweater was an impulse knit, for my lovely and adorable baby niece, Lila. 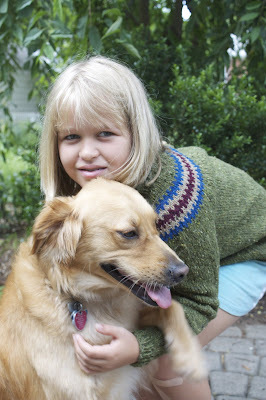 She has already received and promptly grown out of her first Aunt Lizzie knit, so it was time for another. Some stashed Cotton-Ease and leftover Katia Jamaica combined into yet another Baby Surprise Jacket, this one about a one-year size as well. San Diego babies need sweaters all year round, so I don't really need to worry about the size, and this jacket just makes me happy to look at. I wasn't a confident or experienced knitter when my daughter was a baby, so I have a feeling that Lila will be the recipient of much knitted cuteness from me. Remember that meme on Facebook, where you agree to make something for 5 people, and they agree to make the same offer? Here's the knitted stuff I made for some of my FB friends. But the crazy has snuck back into the crafty life, with my entire creative time being eaten by the Queen Sized Ripple Blanket of Crochet Insanity. I love it. I lovelovelovelovelovelovelove it. But it is going to be So. Big. I'm using Tahki Cotton Classic and an F hook, and it takes almost 45 minutes to complete one color stripe. I made a tragic error by making it just a little too wide so that one ripple uses about 28 grams of yarn, leaving me about 3 grams short of a second complete ripple. And much of the yarn I am using is discontinued TCC colorways bought as Webs grab bags over the years, so there is no supplementing with additional skeins for a lot of the colors. Which means lots of leftovers. Gah! After a great deal of individual attention, it looks like I'm almost halfway done. But it's getting big enough to be unwieldy, and it requires too much yarn to take on vacation, so I will be putting down the hook periodically and getting back to the pointy needles as I spend most of the rest of the summer on the road: Baltimore, Vermont, the Chesapeake, and many, many days down the shore.